This morning I’ve been a thrifting. I mean, this is hardly different than a lot of mornings. But I found some really great things today. Things to add to current collections of great things. No typewriters or Pyrex, but some more vintage goodness. After a few new additions, this is my current vintage sheet collection. All of them have been purchased at one of the few thrift store’s on my route. I have a few other sets, and they were cute fabric, so they came home with me, but they aren’t vintage. I think I might have obsessive compulsive disorder. I see something I like, and then I must have it in every single color. Sigh, it’s wonderful, isn’t it? And now that I have a large rubbermaid tote full of sheets, it’s about time I figure out what I am going to do with them all. I mean, you know, before they start taking over my house. The pinks are of course my favorites. 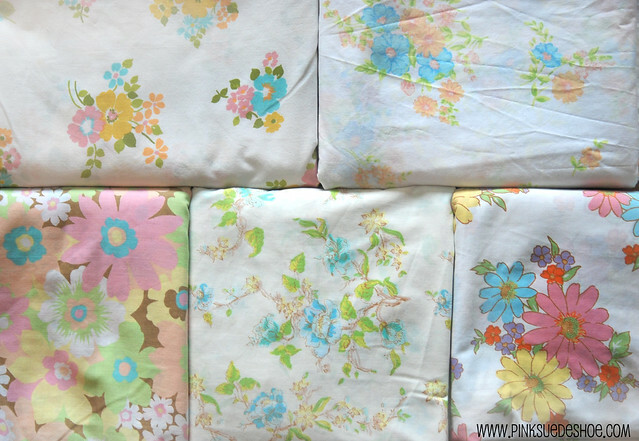 The one in the bottom center was my first ever vintage sheet purchase, and it is still one of my favorites. I’m considering cutting them up and selling them as fat quarters in an etsy shop. But that’s still a few months from being a reality. Creamie has officially stopped napping all together. (Except she is asleep right now. Horray!) And I need some time to adjust to our new normal before I start any more big projects. The strawberries on the left I found on etsy, it was just too cute to let get away from me. My mom has a set of strawberry dishes and these two strawberry sheets remind me so much of her. I clearly need more greens and blues. I found both of these stripes today, but now I’m on the lookout for more cool colored sheets. Of course, let’s be honest, I’m going to buy pretty much any color I find in good condition. See, I’m obsessive like that. This was also a great find from today. It’s a queen sized flat sheet in excellent condition. For $3. When I got it home and laid it out on the floor I realized that it would be the perfect backing for a quilt. Now I just need to get up the courage to cut into these babies to make the front. It’s going to take a while for that to happen. And I think I’ll need to find some solids to break up all those patterns. 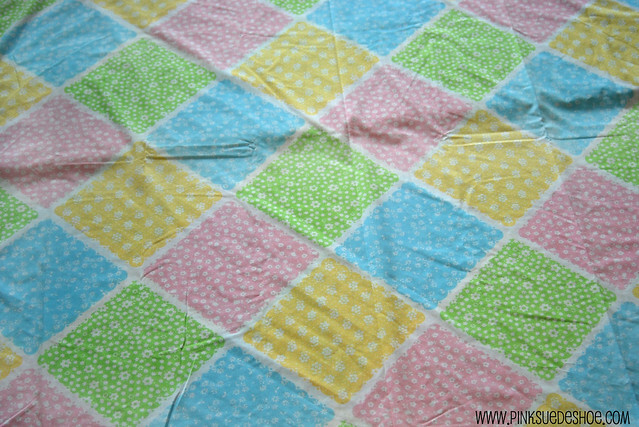 But vintage sheet quilt is now added to me 2011 To Sew list. You know, along with a gillion other projects. My mom has/had 2 or 3 sets of these when I was growing up. 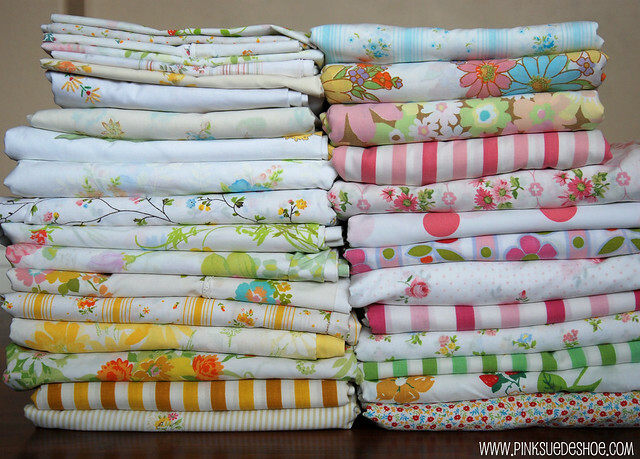 When my daughter was a baby, I liked baby quilts made out of fabrics that looked like “vintage sheets”. I LOVE the pink fabrics, too! My sister’s baby quilt made by my grandma was actually the fabric with the multicolored pink yellow green and blue blocks. I think you need to do some quilting and make some cute sundresses for Creamie… That will fit once it gets warmer. If your into it, I bet you could even make a cute matching mom and daughter ensemble with some of the fabric. Well, those are my ideas at least. Good luck! You got some great finds. I recognize some of the sheets I have in my collection, in your stack! We had those green striped sheets in my house!!! I cannot allow myself another collection. I cannot. Oh, how I love the stripes! and the florals, of course, but I’m just drawn to stripes. Someday you should show me how thrifting is done. Maybe I’ll just raid my mom’s linen cupboard next time I’m home. I know she’ll thank me for it. OMG — My heart lurched at the first picture. One of those, um, vintage (?!?) sheets is identical to a set I had when I was first married. Now I’m freaking out at the thought of being “vintage” myself. ACK! How could/did that happen?!? Further inspection revealed a couple of other sheets identical to ones I owned as a young mother. I have to admit that the small vine with milti color flowers was on my bed as a child…. does that make me vintage? I can’t help but ask the obvious question; Why not use them on your beds? The sheets are beautiful and would be a dream to fall a sleep between and a gift to wake up under. 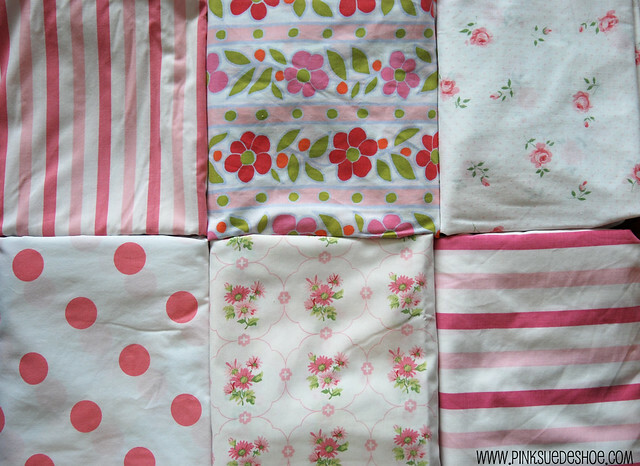 Because I am a girl of function and “using what I have”, why not cut up a few and make pillow shams (the front from one, the back from another and a ruffle along the 4 sides from yet another) and/or duvet covers? I love your ideas and look forward to learning more! I think Scott would rather die than sleep in floral sheets! Though if I wasn’t taking his preferences into consideration I’d totally put theses pretties into rotation on my bed. 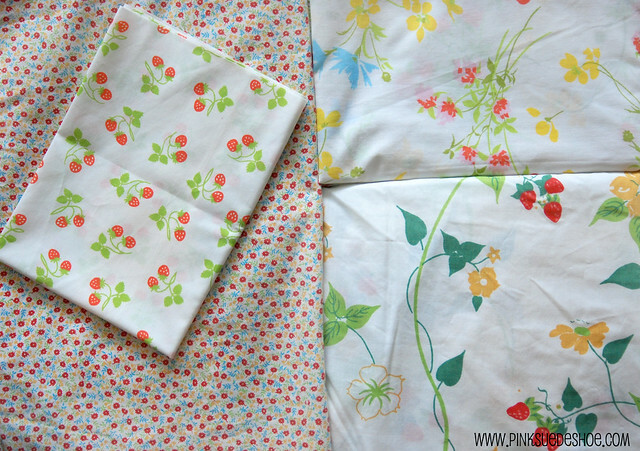 We compromised on a botanical leafy/manly fabric a few years ago when I made our duvet cover and shams. 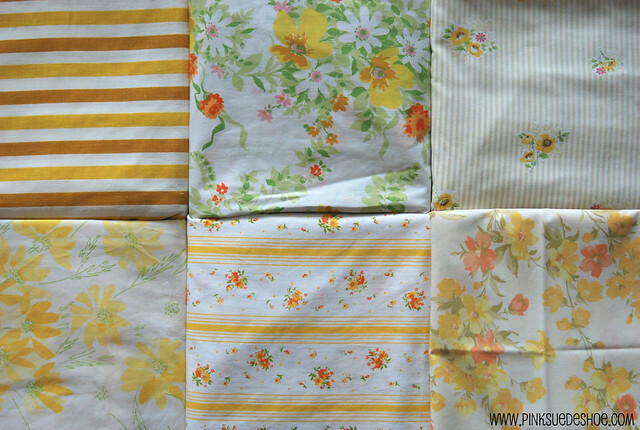 That was before I knew about vintage sheets, otherwise I might not have given in so easily and he’d be sleeping in pretty pink and yellow flowers. Ha! so pretty! I have a couple of those same patterns from my granny. Most have been cut up into quilting squares. Now I just have to learn to quilt! OH I’m jealous! These would all make such cute quilts. What a great variety you’ve stocked up on. They look so pretty stacked up together. Looks like you have a great collection. My favourite is the strawberry one you bought on Etsy. Yes, Yes, Yes, sell them!!!!! Sell them all, but let me have first dibs! I have to admit, when your friend Susan said you should put them on your bed, I shouted at my computer, “No! Don’t do it!,” and then I saw Scott saved the day by not wanting to sleep on floral sheets. Whew. I can breathe again. You’re collection is total drool-worthy, and really, when you want to sell, call me. No Kidding!!! (wiping drool from chin) I really so so so like your sheet collection. What a great eye you have! Just seeing them stacked together screams QUILT QUILT QUILT. What a gorgeous one it will be. I just went to the thrift store today to let the girls buy something with their hard-won tooth fairy money, and of course I saw 7 yards of beautiful blue on white swiss dot. I ask you. For 7 dollars. I had a small twinge of guilt as I bought it. I JUST cleaned out my craft room. 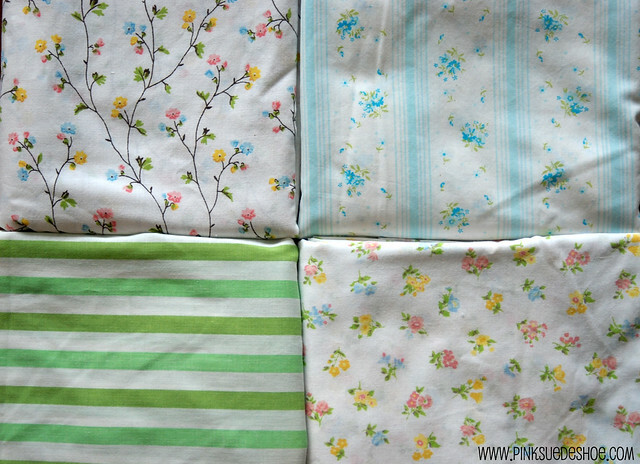 I had the patchwork sheet and the blue & white striped one in the pic above it. Now I’m vintage. Great. Now I know what to do w’ old sheets. Great! Think Mom might have a few salvaged from Ike that are 60’s/70’s. Check w/her. I totally have a large pillow case with those big yellow stripes!! I love old pillow cases – they’re soft and broken in. Sixth picture down (the greens/blues section): my mom had that print in the bottom right corner, the floral one. She had king size waterbed sheets, plus the comforter and she bought extra sheets to make little valances for her windows. I think the valances might still be up. But I could be wrong. She LOVED that print. She uses the waterbed sheets on the futon now — makes tucking them in easier. Oh, and I’m pretty sure she still has those green and white striped ones next to the floral print. So, what does this say about me? 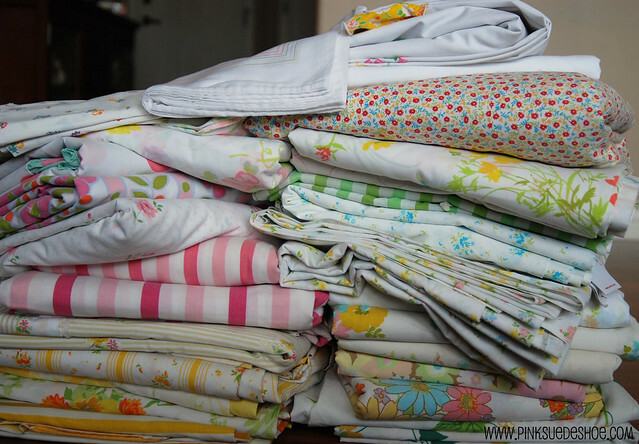 If sheets that I have used in my lifetime are now vintage, does that make me vintage too? P.S. Somewhere in my blog travels, I saw the most beautiful log cabin quilt done with vintage sheets. No solids involved — just straight vintage sheets. I’ll see if I can find it and link you to it. OK, I’m back. I found it: Wonky Log Cabin Vintage Sheet Quilt top, and here it is finished. You may have already seen this, though, because while I was flipping through Dee’s blog, I saw you’d sent her your adorable orange polka-dotted pumpkin. Oh, and I lied. There were solids in the quilt. Hopefully this is helpful, rather than pushy. Whatever you come up with for your sheets will be fabulous.